Happy Tuesday, hope all is well?! 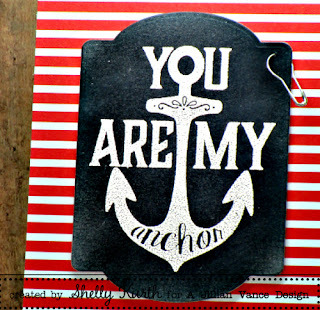 I'm swinging in today, to share a sweet little card with y'all! Believe it or not, I used only one stamp for my card! Yes, one. You see, just one stamp works, yeah? 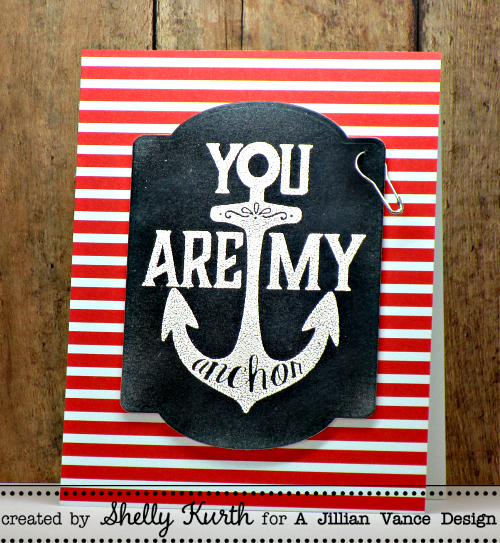 !...I used the Simply Said: Anchor set, along with the Chalkboard Backdrop die set. Since the die set is called: Chalkboard backdrop, I decided to go with a chalkboard theme. And since I have no pattern paper (or any paper for that matter) that resembles a chalkboard, I made my own. Now, I'm not sure of the technique people use to make their own chalkboard paper?...Though, I used some black distress ink and some white pigment ink. I started with my black and added it in layers, which in some areas I chose to have it darker than others. Once I liked the way it looked, I took a little bit of my white ink and just smeared it here and there. If it looked like I added too much white ink (which yes, it did to me.) I just went back over it with my black ink until I got the look I liked. Love the bold nautical design! oh I totally love this!!! fabulous!! A fabulous card Shelly, love that big anchor! Beautiful! I love the bold colors! Such a great, bold design, Shelly! Love your strips and chalkboard combo!! This is so so AWESOME!! I love chalkboard look!! Soooo cute! This is just adorable, Shelly!